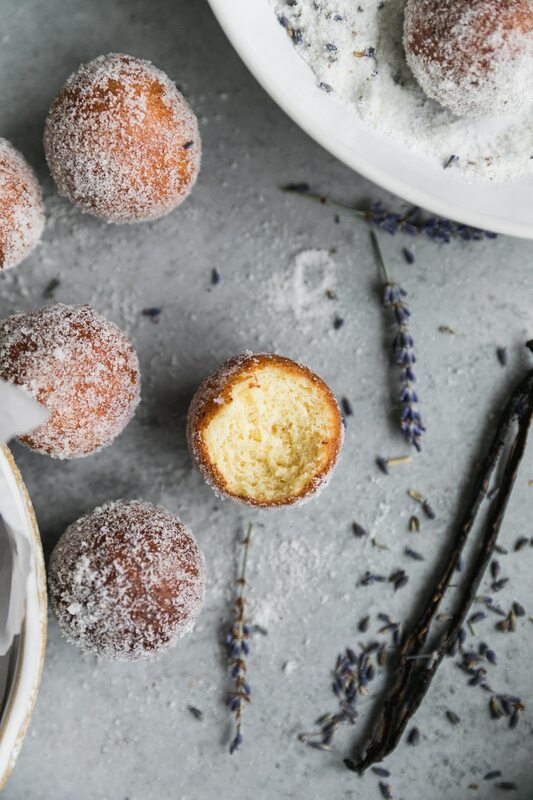 These ricotta doughnuts are so light and fluffy, and they require less than 10 ingredients! 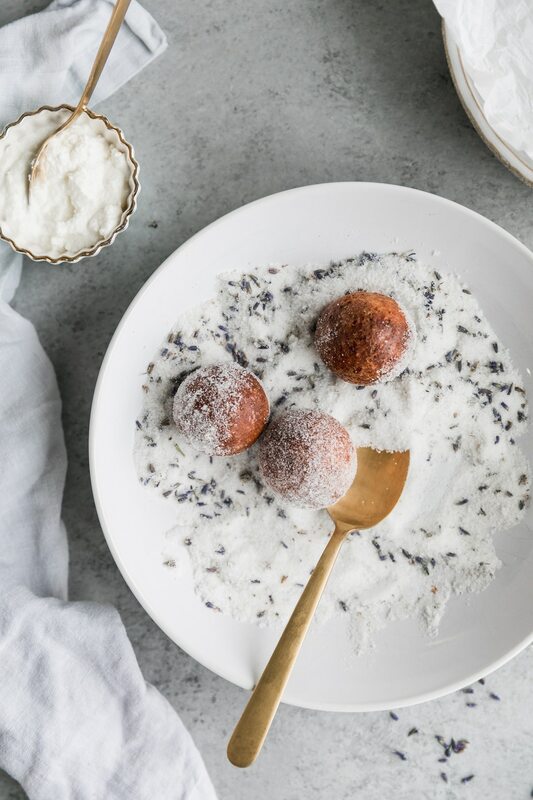 They’re coated in a lavender vanilla bean infused sugar, and they make a great addition to a weekend brunch or fun breakfast with a cup of coffee! 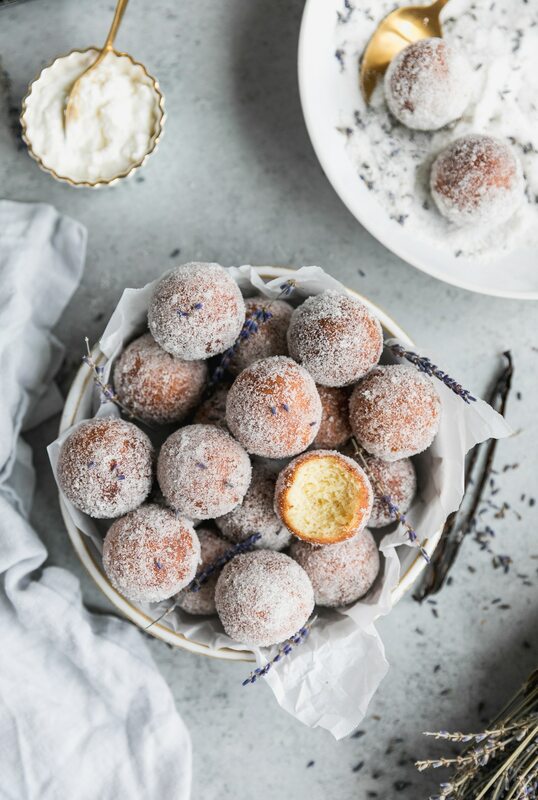 Ricotta doughnuts. Need I say more? They’re SO amazingly light and fluffy thanks to the ricotta, and the lavender vanilla bean sugar puts them over the top! And the best part – you don’t have to wait a million years for the dough to rise, because no yeast is involved! The dough comes together in minutes. Literally minutes. It’s just ricotta (make sure you use whole milk ricotta, not that part-skim stuff 😉 ), eggs, flour, baking powder, salt, sugar, and vanilla! You mix it all up (in one bowl! ), roll them into balls, and quickly fry them! This is definitely an instance where deep frying is definitely worth it. It’s truly not nearly as scary as you might think. 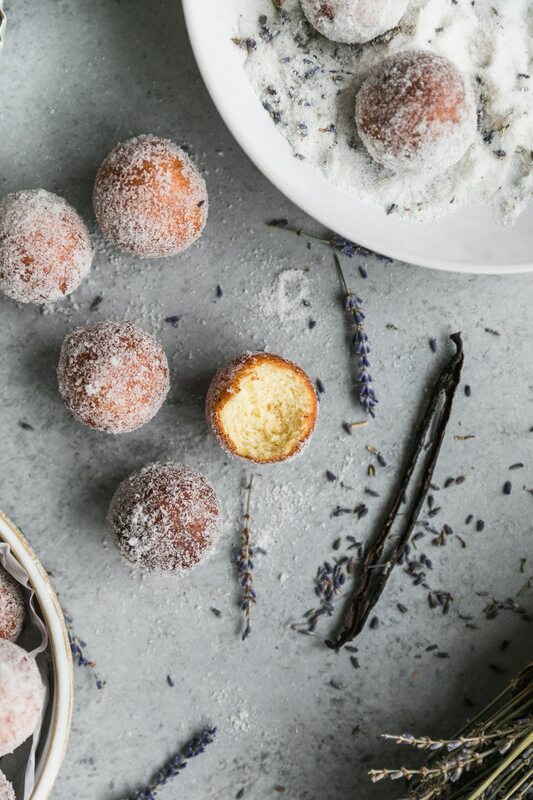 I find it super fun, and you only need a few inches worth of oil in the pot for these little doughnuts! It can be a fun weekend brunch project! Look at how fluffy they are!!! 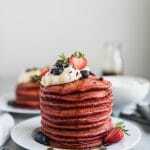 I mean, who wouldn’t want to eat these for weekend brunch? If you’re like me, you always need a savory dish and sweet dish at brunch. Which is why I always order pancakes and/or doughnuts in addition to my benedict or brunch burger, you know, like as a side. And probably fries too. Please tell me I’m not insane. 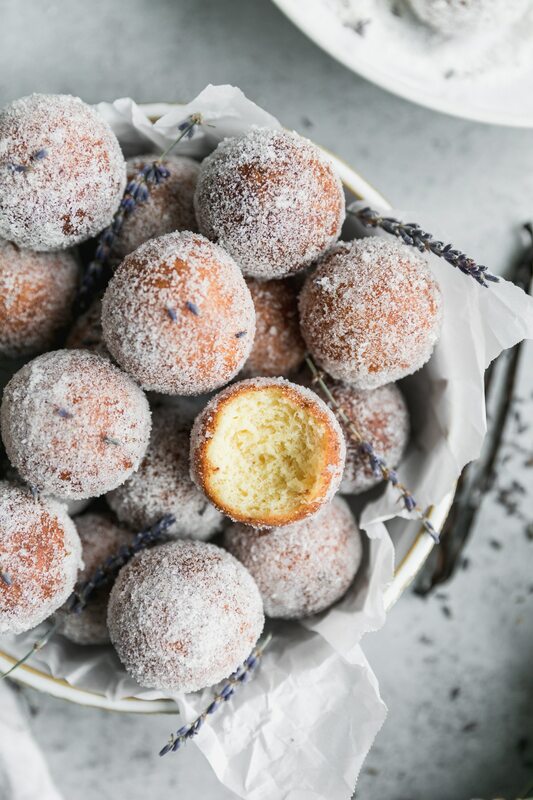 The other best part of these lovelies is the lavender vanilla bean sugar! It’s no secret that I have a love for all things vanilla bean, and lavender is a love of mine too! If you’ve never used it in your cooking before, don’t be intimidated. It’s just dried culinary lavender petals, and they give a super light florally taste to whatever you put them in. My personal favorites are to use it in baked goods and simple syrups! For stuff like cocktails and coffee! And you can find it here ! 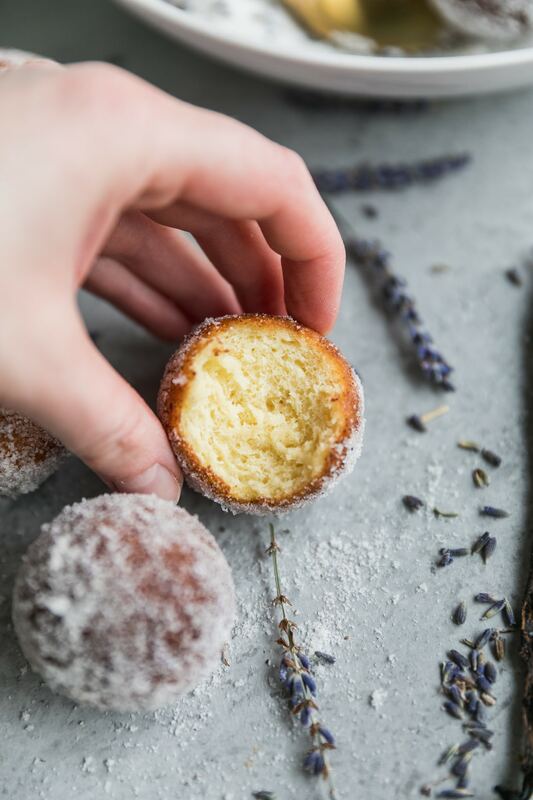 To make the sugar coating, you just massage the lavender and vanilla bean seeds into the sugar using your fingers until it’s infused and fragrant! Couldn’t be simpler. 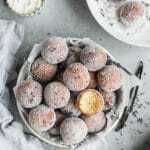 You could do a lemon sugar using lemon zest, a coffee sugar using finely ground coffee, a cinnamon sugar version, a fruit version using freeze dried strawberries and/or raspberries…the possibilities are endless! But how fun would that be?! I can’t think of anything else I’d rather do on a Saturday than devour this whole bowl with friends with a huge iced coffee in hand. You know?! Gahhh I’m in love. 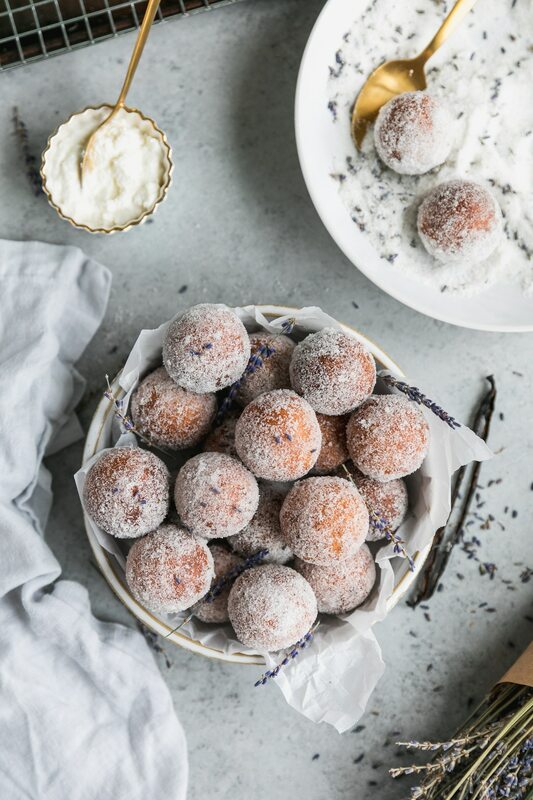 These ricotta doughnuts are so light and fluffy, and they require less than 10 ingredients! 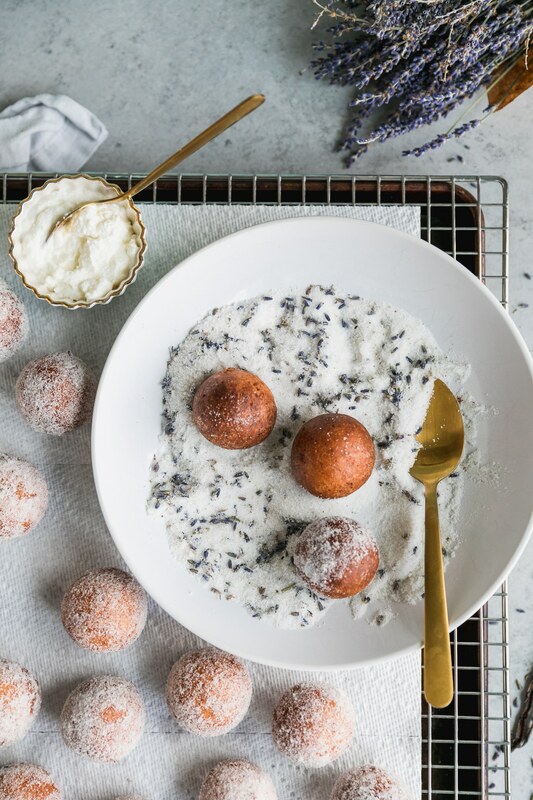 They're coated in a lavender vanilla bean infused sugar, and they make a great addition to a weekend brunch or fun breakfast with a cup of coffee! Heat oil in a large pot or dutch oven fitted with a thermometer over medium to medium-high heat until it reaches 350℉. Line a baking sheet or wire rack with paper towels and set aside. Meanwhile, make the dough. 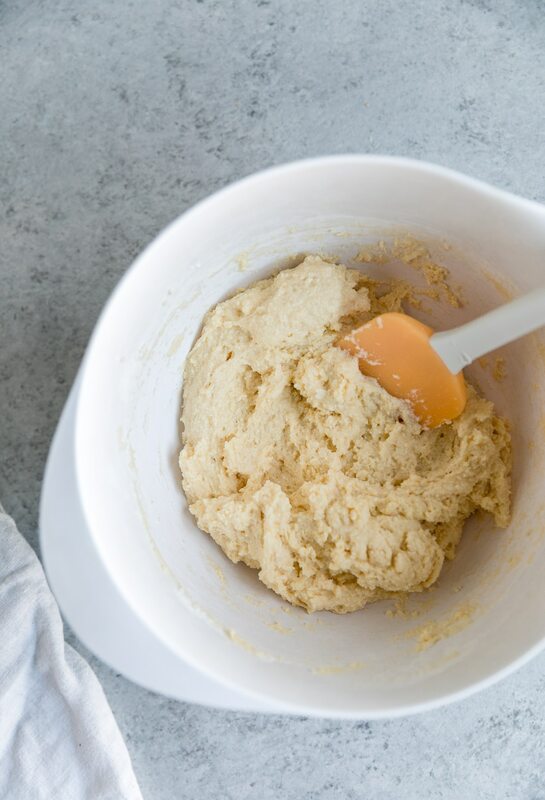 In a medium bowl, whisk together the ricotta, eggs, sugar, and vanilla until smooth. Add the flour, baking powder, and salt and stir until combined. Wet your hands (it will prevent the dough from sticking), and roll the dough into 1-1 1/2 inch balls (smaller than a golf ball - they will puff up quite a bit!). You should get about 20 balls. Set them on a piece of wax or parchment paper while you wait for the oil to come to temperature. Make the sugar. Combine the sugar, lavender, and vanilla bean seeds in a large bowl and massage the lavender and vanilla bean seeds together until combined and fragrant. Set aside. Once oil comes to temperature, gently lower 5 or 6 balls into the hot oil and fry for 4-5 minutes until they are golden and puffy. Be sure not to overcrowd the pot, as the temperature will drop and your doughnuts won't cook all the way through. 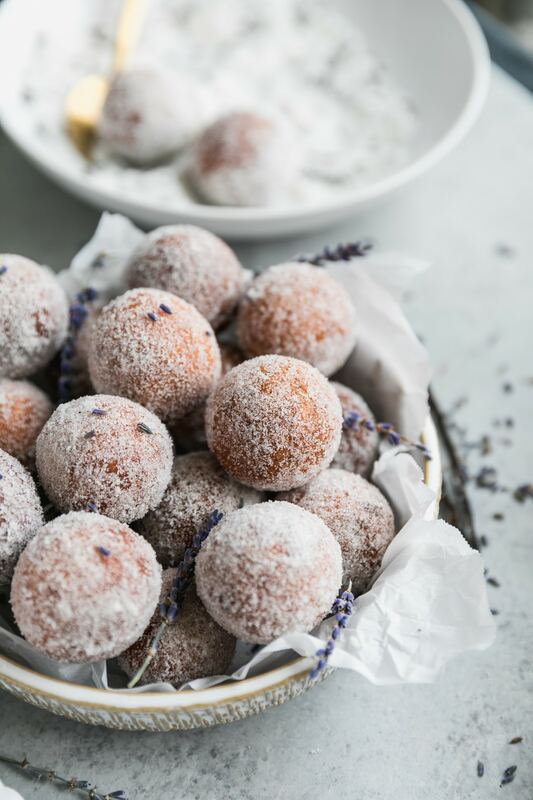 Drain on prepared baking sheet or rack for a few seconds, then toss the doughnuts in the lavender vanilla bean sugar until coated. Repeat with the remaining dough. Serve immediately! YASSSSSS! 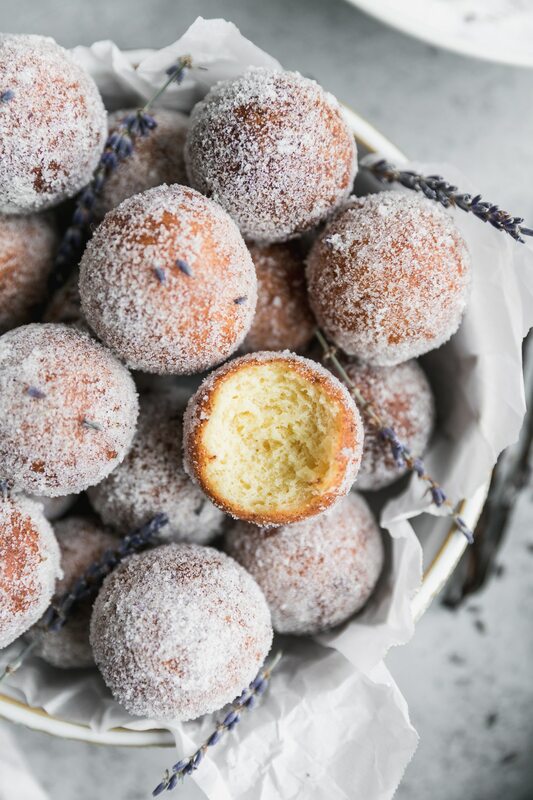 I love lavender, I love donuts. This is PERFECTION!